The Balearic island of Ibiza is renowned across the world for having some of the best and biggest clubs on the planet. But despite its rowdy reputation, there is a stark contrast between night and day here, and Ibiza is home to some beautiful beaches and countryside. Properties in San Antonio can yield huge rental turnovers, as in the party season they are almost guaranteed to bring in high weekly rates. If you are buying for yourself in this part of Ibiza, however, take the surroundings into consideration, since the festivities don't usually stop until 06:00. 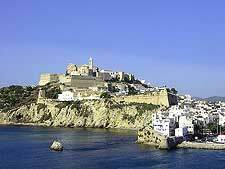 Dalt Vila in Ibiza Town offers a contrast to San Antonio, with time-worn cobbled streets and historic architecture. The 'High Town' area is also very popular with its position overlooking the bay and large houses with private gardens. As parts of Ibiza Town are designed as a World Heritage site, property here can be hard to find, so it is important to get in quickly if you see something you like. Apartments and villas are easier and cheaper to source away from these main centres in the likes of Santa Eulalia, San José and San Juan, with beach-facing property fetching a premium. 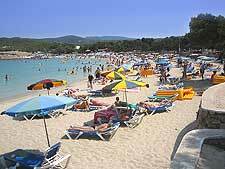 Apartment lets are easy to find at all main beaches, from Cala d'Hort to Ses Salines. As is typical of large holiday destinations, serviced apartments in Ibiza tend to cater to the holidaymaker market. There is a lot of choice in the beach areas of San Antonio and San Lorenzo, but serviced apartments in these regions can be extremely expensive during peak season. Bargains can be secured for long-term rentals in low season and in the quieter, more suburban areas away from the main resorts. Many of the cheapest apartments will ask for a commitment of at least one year and request references and a guarantor. Fully-furnished apartments can be as much as twice the price of empty ones, yet are cheaper than comparable hotels. Buyers looking for property in Ibiza Town are best to base themselves in Ibiza for a while and keep their ears to the ground, as the desirability of the area means properties rarely come on the market. Apartments near the main beach areas come up more frequently, but you do get a lot less for your money than in the island's more remote areas. It is important to employ a lawyer to do the conveyance and legal searches, and to transfer the title deeds and arrange taxes. Bad decisions can prove expensive in Ibiza, so it pays to do your homework and be aware of any potential issues. An agent will charge anything from three to ten percent, and there is also a yearly wealth tax to consider and community charges for those in serviced complexes. Picking an agent is one of the most important considerations for those looking to buy in Ibiza. Finding a really professional company is half the battle - the biggest organisations are not always the most reliable. Finding someone you can converse with in English well will also make life easier. Expat forums can be a good place to find recommendations for agents. Villa Contact has lots of experience and deals in high-value properties. BBS Consulting is truly multilingual and offers great advice.